“I’mma do the things that I wanna do … I don’t give a hoot about what you think” sang Rivers Cuomo on ‘Pork and Beans’ in 2008. By then, of course, those of us whose brains were permanently inscribed with Pinkerton lyrics like a compass-scarred school desk had long since given up on ever being similarly impacted by a new Weezer record. Say what you want about Rivers, though, he’s nothing if not sure in his convictions. The decade since The Red Album has seen another five Weezer records cheerfully fired out to varying degrees of apathy, resignation and brave faces from the remainder who never quite fully gave up on the band. Their series of self-titled albums was scheduled to reach its fifth installment with the forthcoming release of The Black Album in March. However, they’ve surprised us all by dressing like background characters from an Eighties flashback Friends episode proffering The Teal Album, a set of covers to keep us occupied in the intervening months. But the charming/infuriating cover shot (delete as per your preference) is a mere fraction of the story. The tracklist, you see, seems to have been directly inspired by a copy of The Best Pop Songs in the World… Ever! which Rivers presumably had lying around in the garage. Taking on one or two of these songs is bold, but I’d contend that committing to an entire album of them is pretty damn brave, even if you do have the luxury of 11 albums behind you and little to lose. There’s an argument to say that the likes of ‘Billie Jean’ and ‘Sweet Dreams (Are Made of This)’ are such good tunes that it’s pretty much impossible not to sound good recording them, but all the same I don’t know many singers who’d fancy having a crack at following in Annie Lennox’s footsteps. Let’s not forget, too, that musical history is plagued by examples of indie dudes thinking it’d be a laugh to ironically cover a pop song (ugh). Worse still, how about those who, like boring fuckers at a party, slow the pace and strip a banger down to voice and acoustic guitar in a hideously misguided attempt to inject some kind of ‘legitimacy’ to it (more ugh). I still shift uncomfortably in my seat at the thought of some of the terrors wrought by The Live Lounge in the early Noughties. I’m sure I didn’t dream The Ordinary Boys’ heinous attempt at ‘All the Things She Said’ by t.A.T.u, and I’m still trying to repress the memory of the otherwise wonderful Hope of the States taking on ‘Beautiful’ by Christina Aguilera. 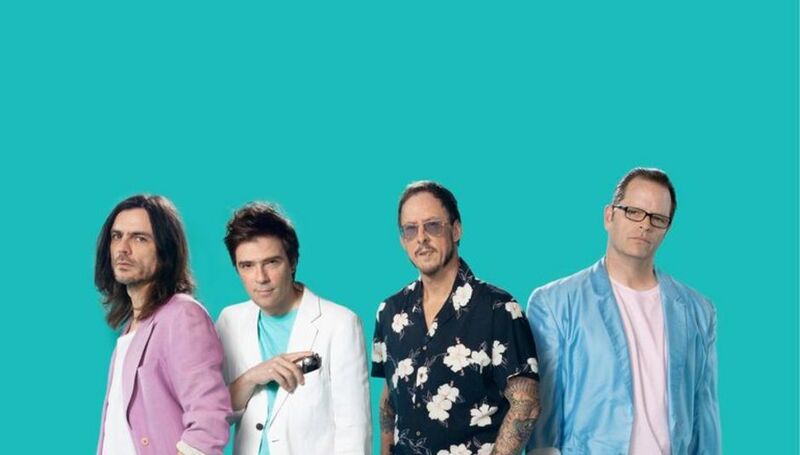 In spite of all the possible pitfalls Weezer could have faced in its delivery, The Teal Album is a truly pleasant surprise, and one of the most likeable records to have emerged in recent months. Crucially, they’ve clearly taken their source material very seriously indeed. The LP’s catalyst and opener, their well-documented cover of ‘Africa’ is a great taster of what’s to come in how faithful it is to the original, right down to the periodical authenticity of the production, a trick they also pull off when they dip further back into history with ‘Mr Blue Sky’ and ‘Happy Together’. It’s often said that a great cover brings something new to a song, but at this point in time it’s difficult to imagine what merit anyone could ever add to ‘Paranoid’s riff or the synth melody of ‘Take On Me’, so it’s probably sensible that Weezer don’t even try to experiment. If you look closely enough, though, you’ll still see the occasional evidence of Rivers’ fingertips on songs and it’s enough that it doesn’t feel like complete karaoke or a one-listen curio. The plaintive simplicity with which ‘Stand By Me’ in particular is delivered has a whiff of Weezer’s own finest moments of vulnerability. There’s little doubt that The Teal Album is something of an indulgence, but it would be churlish to argue that it’s one Weezer haven’t earned on the basis of sheer persistency if nothing else. You can’t help but feel if they’d split up (again) after Maladroit and given it 15 years or so before launching a big-stage comeback, they’d be in a stronger position as far as critical reputation goes. The least they deserve for sticking to their guns so long is a bit of fun with their favourite songs. Especially when it’s such an infectious affair.